Climate change projections indicate that many areas of South Africa will experience higher average temperatures and reduced rainfall. As South Africa is already a water-stressed country, climate change is will lead to increased water scarcity and shortages in many areas. Flushing toilets can be responsible for up to 40% of the total water consumed in buildings and this technology is therefore increasingly unsustainable in many areas and alternatives have to be identified. Gauge has developed a range of technologies and kits that address climate change and improve the sustainability performance of buildings and urban areas. Technology is designed to be easily and cost-effectively implemented and suit a range of contexts and building types. 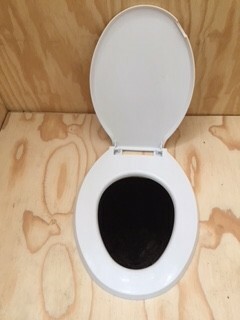 One of the technologies developed by Gauge is an easy-to-assemble low-cost composting toilet, called a Compoloo. Compoloos do not use water and electricity and provide useful compost that can be used to enhance the soil fertility. Very large water savings can be achieved using the technology and up to 27litres per day per person, or 9,855 litres per year, can be saved. This ensures that more water is available for drinking, washing, cleaning and for irrigation which directly support health and well-being. In addition, significant operational savings from reduced water and sanitation utility charges can be achieved. Compoloos are designed as ‘flat packs’, which enable them to be easily transported and assembled on site in 1 or 2 days. They are more cost-effective than waterborne sanitation and pit latrines. As they are made of readily available materials, Compoloos can be easily maintained locally. Compoloos come with operation manuals and training and can be installed singly, for instance at a household level, or in large numbers, for instance at a school or at a festival, park, or camp sites.